There are many old traditions and folklore associated with the Feast of Easter, many of these aligning with the Festival of Passover - the eight-day festival celebrated in the early spring, from the 15th through the 22nd of the Hebrew month of Nissan. Passover commemorates the emancipation of the Israelites from slavery in ancient Egypt. The Passover sacrifice (Hebrew: Korban Pesakh קרבן פסח), also known as the "sacrifice of Passover", the Paschal Lamb, or the Passover Lamb, is the sacrifice the Torah mandates to be brought on the eve of Passover, and eaten on the first night of the holiday with bitter herbs and matzo. The Festival of Passover is an ancient tradition and quite involved – in biblical chronology, the freeing of slaves from Egypt, and a nation under Moses, would have taken at about 1300 BCE. Simply put the Feast of Easter, in western terms, encourages fish to be eaten on Good Friday, along with Hot Cross Buns – see Notes below for the background on this tradition. Easter Sunday, along with Easter Breads and Cakes, would be when the meal consisting of unleavened bread, bitter herbs and lamb would be the menu. With so many fresh vegetables, herbs and fruits as part of our modern day menus, you can adapt these to suit your families tastes but including a few nods towards where we have come from can make this a universal celebration for all and keep it a ‘Feast of Gladness and Joy’ as some traditions state it to be. Most of our salads now incorporate vinegar in some form, and fresh herbs added as sprigs or as the whole salad itself, as in the recipe for Tabouli, or knowing that Sage is also a purgative or that Rosemary is anciently ascribed to being good for the memory, and is part of ANZAC Day due to the hills of Gallipoli being covered with this wild herb as well as the ancient lore of ‘memory – remembrance’, may make your Easter meals contemporary ‘Feasts of Feasts’ a continuance of what is still spoken in all tongues and by all peoples today. We have included some of these old recipes, all of which have some association in their lists of components with the Feast of Feasts, some which also reflect the social conditions, or ingredients available during their years of publication, and all of which you can try out now. Let the lamb roast stand at room temperature for around 15 -20 minutes before cooking. This takes the fridge chill from the lamb and allows it to cook evenly. Brush the meat with some oil and season the lamb well with herbs such as fresh rosemary. Cover the roasting dish with a sheet of baking paper as well as foil for the first half of the cooking time and then remove them so the lamb browns well. Use a roasting dish similar to the size of your roast. Rest it on roasting rack or a bed on onions wedges or garlic cloves – these can be squeezed into the jus or juices that collect in the pan dish for a very fine gravy. The lamb has been cooked for the longer option will fall from the bone. Use two forks to shred the meat if you like. Boiling eggs in vegetable coloured waters can give a great base for your children to build on – purple cabbage for…purple, green spinach for green, beetroot for pinks, all of which can then be incorporated into other Easter dishes, make nice backgrounds for little hands to paint on and give to others or use as table adornments for breakfast. The pastry should be chilled for at least 30 minutes before using - pastry experts recommend that pastry is made the day before and kept in the refrigerator for best results. As all the vegetable ingredients for the filling are not pre-cooked it is important that they are sliced very thinly or par-steamed until still firm but cooked. Roll out the pastry on a board floured with a large side plate or small dinner plate, cut out four rounds. In a large bowl mix prepared vegetables, herbs and seasoning and moisten with the vegetable stock. Gently add the fish and mix once more. On a lightly greased baking tray place your first round of pastry. Heap 2 to 3 tablespoons of this vegetable mixture in the centre of each pasty. Bring up each side of the pasty to the centre, and crimp, using a fork to seal edges if needed. A good point to note here is that if you have too little mixture the filling will shrink during cooking and your pasty will be half hollow, if you put too much in the pastry will crack and you will lose all the moist goodness. Brush the pasties with the beaten egg and bake in a hot oven 220°c for 10 to 15 minutes then turn down the heat to moderate 180°c and bake for about 30 minutes, until the contents have cooked in their own juices. If you have par-cooked the vegetables only 10- 15 minutes will be needed. Serve immediately or wrap in aluminium foil and put in an insulated picnic bag for a picnic outing or barbecue on Good Friday. Place cracked wheat, tomato and lemon juice in a bowl. Stand, covered, for 30 minutes or until burghul has softened. Add parsley, mint, onion and oil to cracked wheat mixture. Stir to combine. Process peas until roughly crushed or leave until cooked and use a potato masher to break ip. Heat butter in a pan over medium heat. Add eschalots and cook until soft. Add stock and cream. Simmer until reduced by half. Stir in peas and mint. Cook until warm. Season with salt and pepper if desired and serve with your lamb or pasties. One pound plain flour, 1 teaspoon salt. 1 oz. compressed yeast, good breakfast cup milk. 4 oz. sultanas.2 oz. butter. 4 oz. sugar, 1 egg. cinnamon if liked. Crumble the yeast into a basin; add 1 teaspoon sugar. 1 tablespoon flour; stir in the milk and allow to stand 1 hour. Sift the flour and salt, rub in the butter, add sugar and fruit. Beat the egg well, add to the yeast mixture. Add all to the dry ingredients. making into a soft dough. Put into a clean, warm basin, stand in warm place about 45 minutes or till well risen. Turn on to a floured board and knead well. Cut into 20 pieces(large or small if liked) and make each piece into a round. Place "on a greased Swiss roll tin, close together. Leave for 10 minutes. Mark each with a cross, using the back of a floured knife. Bake in a hot oven 20 to 30 minutes. Mix equal quantities of icing sugar and water. Boil for 1 minute. Brush buns with the glaze. Return to often for 1 minute. Turn on to a cake-cooler. Use 1 lb. flour, heaped teaspoon baking powder, 1/2 lb. butter, three small eggs, 1/2 lb. castor sugar. Cream butter and sugar, and beat eggs thoroughly. Add them gradually to the cream, beating the whole time. Then, a little at a time, add the flour, and baking powder, which has been well sieved, stirring well during the mixing. Should the mixture be too stiff moisten with a little tepid milk. If liked a few well-washed currants may be added. Form into bun shapes the size of an egg, put on a well-greased tin, cut a cross lightly on each with a knife, and place into a brisk oven. Bake a quarter of an hour. While hot from the oven brush over with warm milk and sugar. Nine tablespoons milk. 2 oz. butter.1 oz. compressed yeast. 1 teaspoon sugar, J lb. flour. 1 teaspoon salt. 1 egg. Just warm milk and butter. But on no account make it hot. Cream the yeast with the sugar, pour on milk and butter, sift flour and salt. make a well in centre, add milk mixture, then beaten egg; mix 'well til smooth, divide into two. Place in greased tins, allow to stand 1/2 hour. Bake in hot oven 20 to 25 minutes. Turn on to sieve to cool. Twelve tablespoons plain flour, 1 teaspoon baking powder, 4 dessertspoons butter, 4 tablespoons sugar, 1 egg, 6 tablespoons milk, raspberry jam. Sift the flour and baking Powder. Rub in the butter; add sugar. Make into a stiff dough" with beaten egg and milk. Knead well on Floured board. Cut into 18 equal parts; roll each into a round; make a hollow in the centre, put in a little raspberry jam, glaze round edge. Pinch together, enclosing the jam. Place on greased tin; bake in quick oven 10 to 15 minutes. Take 6 oz. butter, 4 eggs, tablespoon cornflour, grated rind one orange, 6oz. castor sugar, 2 tablespoons milk, tablespoon orange juice, 3-oz. sliced orange peel, 8oz. Self raising flour, few drops essence of lemon. Method: Beat butter and sugar to a cream. Beat in ".eggs, one at a time, each about 3 minutes. Add a little flour, then orange juice and milk, cornflour, the grated orange rind, peel, essence, and rest of flour. Bake 2 hour, is a moderate oven. When cold, ice all over. Use 1lb. Icing sugar, a few drops orange juice, about 15 tablespoons boiling water. Beat well. Spread on cake with a knife dipped in cold water. These are popular at picnics among both adults and children. They are not difficult to make and it is a good idea to have a large tinful made before the picnic outings and Easter gatherings begin. Mix together 1 cup butter (or good dripping), ½ cup sugar and h cup honey. When well mixed and creamy add 2 cups flour, with which has been sifted 1 teaspoon salt, 4 teaspoon soda, and 2 teaspoons ground ginger. Put in small spoonfuls on greased slide, leaving plenty of room to spread, and bake until done. Leave on tins until they are cold and crisp, then store in airtight tins until wanted. This is a delicious cake and something that will be appreciated at any of your Easter festivities: Break4 eggs into a basin and beat slightly. Gradually add 1 lb. sugar and beat for 15 minutes with a double rotary beater or a strong whisk. When very light and fluffy, add ½ lb. groundnuts, mix in well and then mix 3' tablespoons very fine white breadcrumbs. Place in a square cake tin about 2 inches deep, which has been buttered and lined with paper, and bake for 30 or 40 minutes in a moderately hot oven. When cold, split the cake in the centre, spread with 1/2 cup warmed apricot jam and 1 cup well whipped and flavoured cream. The Last Supper celebrated by Jesus and his disciples was a Passover Seder. The early Christians too would have celebrated this meal to commemorate Jesus' death and subsequent resurrection. 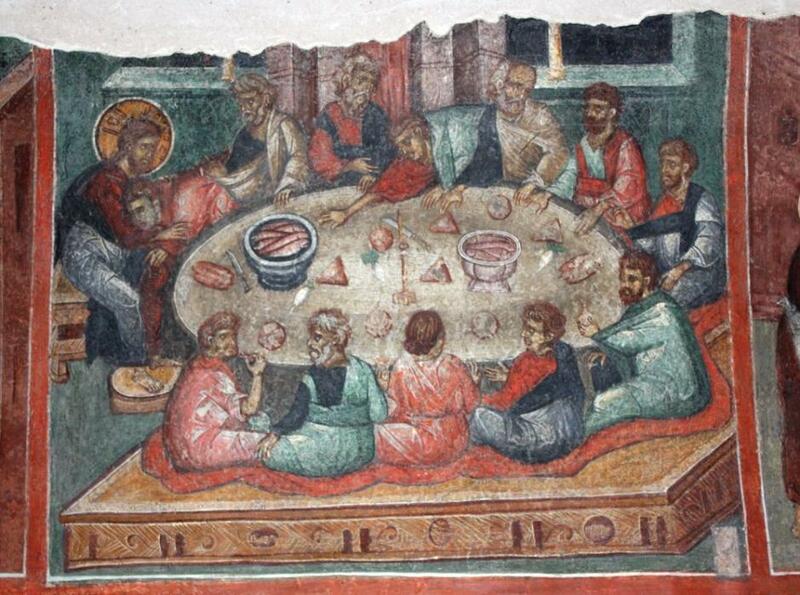 Last Supper fresco from Kremikovtsi Monastery, Bulgaria, 16th century AD. Photo by Edal Anton Lefterov, 2011. EASTER CAKES. OLD TRADITIONS AND NEW RECIPES. Every great festival has its special dishes to mark it from the ordinary days of the year, and many of these festival cakes have their origin in the dim ages of paganism, for the early Church, with its great wisdom, often superimposed the new tokens of rejoicing on still earlier custom. In this way they preserved the familiar habits of the people while sanctifying them to Christian use. The familiar hot cross bun, which is so firmly established in British tradition, is similar in size and shape to the consecrated loaves which were distributed as alms in the early Christian Church in Rome, and according to some authorities are a Christian adaptation of the cakes offered in pagan days to the Phoenician goddess Astarte, whose worship under her title of Queen of Heaven penetrated many Eastern religions. In practically every religion, both heathen and pagan, there was the sacred cake offered in ritual at shrine and altar, and curiously enough the very title given by the ancient Greeks to this form of sweetened bread made with flour and honey was "bous," or "boun." The Grecian bakers in pre-Christian times were also wont to mark their loaves of bread with a deep cross, so that each loaf could easily be broken into four pieces. Examples of this crossed bread were found amid the ruins of the town of Herculaneum, which was overwhelmed by Vesuvius in A.D. 79. The early fathers of the Church would be quick to see the symbolic interpretation of the crossed loaves, and it is interesting to reflect that in our everyday customs we are perpetuating such a wealth of historic tradition. One a penny, two a penny, hot cross buns!" Men, women, and children used to join in the bun trade, and the hot spiced buns were borne in great linen-covered baskets through London streets, while great care was taken when lifting the linen and flannel covers to prevent the cold air chilling the hot baked bread. In the 18th century Chelsea was the proud possessor of two royal bun houses, where, says the chronicler, "several hundred of square black tins with dozens of hot buns on each tin were disposed of in every hour from a little after. 6 o'clock in the morning till after the same period of Good Friday evening." From a very early period the ignorant attached special veneration to the crossed bread baked on Good Friday morning, and it was the custom in many villages in England for the housewife to suspend one of the buns or cakes to the ceiling in the living-room, as according to legend no house with a Good Friday cake could be burnt down-in the ensuing year. The home-baked cake would haug from there of till the following Good Friday, when a fresh one would take its place. It was also firmly believed that a few gratings from bread baked on Good Friday would prove a remedy for many ailments, especially in diarrhoea, and many families zealously preserved some of the baking for this reason. Among historic Easter dishes in England were the gammon of bacon and the tansy pudding. Eating tansy cake or pudding was a regular part of the Easter celebrations in the early Church in Rome, and signified the bitter herbs used by the Jews in their Paschal or Passover feast, while the eating of bacon was intended as a quaint and deliberate insult to the Jews, who crucified the Saviour. Among the old English Easter charities is that of the Biddenden cakes, distributed in the parish of Biddenden, in Kent after the Easter service. Six hundred of these cakes or rolls, stamped with the joined figures of two women, were distributed among the churchgoers, and in addition 270 of the poor parishioners received a loaf weighing 2Jlb. and l£lb. of cheese. This quaint bequest to charity was made by two maiden ladies who died (according to local tradition) in the 12th century, and who left 20 acres of land known to posterity as the "Bread and cheese land," from which the rents were to be given in perpetuity to the poor of the parish or to strangers in the form of Easter bread. With the process of time many strange legends have grown up around the two donors, but from historic records it is known that their bequest was in operation long before the year 1650, when an attempt was made to alienate the property of these two Biddenden maids to become part of the village rectory. Right: 'Osterpostkarte' by Arthur Thiele (1919) - 'Easter Postcard'. The modern housewife has many resources at her command, and her cakes would astonish and delight the cook of ancient days. The illustration shows some new" Easter cakes and Valentine biscuits which' will bring variety into festive gatherings at this season. I at any sweet shop. CHICKEN CAKE.—Beat 5oz. of butter to a white cream with 5oz. of sugar. Whisk four eggs until like a smooth custard, and sift 8oz. of self-raising flour. Flavour the butter cream with the grated rind of an orange, and then beat in the eggs and(flour alternately. Bake in a well-greased tin in a moderate oven for about au hour and a half, and when cold ice with orange icing all over and decorate with tiny chicks. When the icing has set lightly pencil "Happy Easter" across the top of the cake and mark in the lettering with deep yellow icing passed through a forcing tune. MOCHA CAKE.—Beat four eggs over hot water until light and fluffy, and then beat in a cupful of castor sugar. Continue to whisk the mixture until all trace of sugar has disappeared. Flavour with a few drops of vanilla essence, and gently fold in a breakfast-cupful of self-raising flour. Mix a dessert-spoonful of coffee essence with one of warm water, and stir through the mixture. Bake in two or three shallow, well-buttered tins in a moderate oven. When cold put the layers together with mocha cream and ice all over with the same. Decorate the top with some of the cream put through a forcing bap:, and adorned with spikes of almond, b or the icing beat some butter with double its weight in castor sugar to a smooth cream, and add sufficient coffee essence to give it a nice taste and colour. Add a few drops of essence of vanilla. Another way is to. ice the top layer in the usual method with icing sugar flavoured with coffee essence and beaten smooth with a few drops of hot water, and to put the layers together when required with a tilling of sweetened cream strongly flavoured with coffee essence. PLAIN ALMOND CAKE.—Beat half a cup of butter with a cupful of sugar to the usual smooth cream, and then flavour with a scant teaspoonful of essence of almond or vanilla. Add half a teacupful ofmilk and one and three-quarter cups of sifted self-raising flour. Lastly add the stiffly beaten whites of four eggs, folding them in with the second part of the flour so that the mixture does not get too dry.Do not beat the cake once the eggs are added, just "stir and fold" gently until well blended. Turn into a well-greased tin, and scatter halves of blanched almonds over the surface. Bake in moderate oven. If, preferred this cake can be iced with almond icing and then with white icing flavoured with vanilla. Right: Boris Kustodiev's Pascha Greetings (1912) shows traditional Russian khristosovanie (exchanging a triple kiss), with such foods as red eggs, kulich and paskha in the background. DURING MARCH the festival of Easter is observed. Early fathers used to speak of Easter as the "feast of feasts" and the ‘queen of days," but in addition to! its religious aspect we think of it as a time of hot cross buns and spiced cakes, Easter eggs, and Easter rabbits. But the present Christian festival has superseded the old heathen feast of Eostur, which was so called because the spring sun had its new birth at this time. When later the feast of the Resurrection came to be celebrated in apostolic times, it was natural to name it after the earlier feast to which it was poetically akin, when, it was thought that the old heathen festival of the resurrection of the» sun was connected with the Resurrection of the "Son of Righteousness." Customs and beliefs of the' ancient ceremony and many new superstitions were grafted on to the modern ceremony. One of the oldest and most widespread superstitions is that the sun participates in the general felicity by'. dancing in the heavens. The idea originated from heathen customs when spectators themselves danced at a festival in honour of the sun. Devonshire girls still rise early on Easter morning to see not only the dancing sun but also a lamb at play in the centre of the disc. This, lamb was considered to be a good omen, since it was thought that it] was the only shape the devil could not assume. THE CUSTOM of giving eggs may be traced through the philosophy and theology of the Egyptians, Persians, Greeks, and Romans, among all of whom the egg was an emblem of the universe; the work of the Supreme Divinity. The Church of Rome considered the egg as a symbol of the Resurrection. Almost every ancient superstition is retained in Italy, Spain, and in Provence. Certain sports which were¡ conducted in ancient times are still played. On Good Friday the village lads hunt squirrel, because of the, legend that Judas Iscariot was changed into that animal. The household expenses of Edward on Easter Sunday, 1305, include "four hundred and' a half of eggs, eighteen pence." These would have been stained in boiling or covered with leaf gold, and distributed to the Royal Household. Spanish confectioners and pastry-cooks display all lands of cakes at Easter- These are principally fashioned around eggs, and may be scattered about the interior of some elaborate pastry farmyard among many kinds of animals. The author Hakluyt describes a nearly Russian law in his Voyages: "They (the Russians) have an order at Easter which they always observe, and that is this: every yeere, against Easter, to die or colour red, with Brazzle (Brazilwood) a great number of egges, of which every man or woman giveth one unto the priest of the parish upon Easter Day, in the morning. And moreover, the common people use to carrie in their hands one of these red egges, not only upon Easter Day, but also three or foure dayes after, and gentlemen and gentlewomen have egges gilded, which they carrie in like manner." IN EASTERN COUNTIES of England the tansy pudding, which was formerly a favourite Easter dish, suggested the bitter herbs of the Passover. Lamb was eaten for its symbolic significance, and spiced cakes represented the spices used to embalm Christ's body. Good Friday was called "The Pasch of the Cross" in the early Church. On this day all penitents were absolved, and it was kept throughout Europe as a day of fasting and mourning. It was originally called "Good" to distinguish it from other Fridays, when luck was notoriously bad, but in the course of time this idea became obscured- and most people regarded Good Friday as a day of ill-omen. To overcome this bad luck and to "keep away the Devil," bread baked on Good Friday was marked with a cross. Thus we now have the hot-cross buns, since the mark of the cross gained the buns a Christian significance. Pittwater Online News, 2015. All Rights Reserved.